A.F.S. Haulage is one of the South’s most established and well-respected hauliers, with over 25 years’ experience in our industry. We specialise in the provision of cost-effective, flexible and reliable solutions to both small independent businesses and large household names alike. As a one-stop-shop for haulage and logistics in Eastleigh, we provide full-load and pallet distribution throughout the UK, Europe, and the Channel Islands. 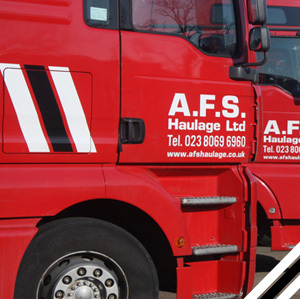 We pride ourselves on our reliable, flexible and customer-centric approach, and it is our determination to set and maintain high standards that has assured A.F.S.’ status as one of the leading hauliers in the South of England. If you need a consignment delivered, you need the assurance that it will arrive, as, when and where you need it. Whilst many hauliers will promise this service, very few will deliver on their promise. We would like to think that A.F.S. is one of the few who do. Arrange a pallet delivery via the Palletways Portal. With owner and Managing Director Andy Seagrave at the helm since its inception, A.F.S. has experienced tremendous but steady growth through a sustained policy of diversification and investment in quality vehicles, systems and people. As pioneers of the ‘one-stop-shop’ approach, the key to their success is the provision of a fully holistic and integrated menu of logistics services tailored to meet customers’ specific haulage needs. 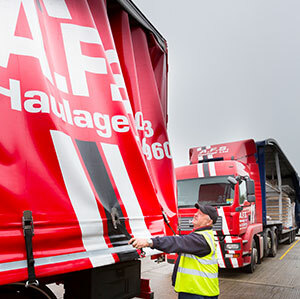 From full load, HIAB, flatbed and ADR consignments, to efficient economic pallet distribution, A.F.S. has the answer to most of your logistics questions. On the rare occasion when we cannot meet a requirement with our own fleet and people, our experience and knowledge of the industry means that we will always know of someone who can.